I wasn’t going to read this because I thought it sounded kind of creepy. Well, it’s not creepy although there’s a tad too much sexual talk for my comfort. There’s also a lot of material which piques my historical interests and Prose’s story has a very compelling story-line, an interesting structure and it’s nicely written. I’m glad I didn’t pass! I never did quite understand how France went over to Hitler so easily, so readily. But what Prose put together was that the revolutions and then Dreifus fed into the idea of “pure French” (as someone’s brother-in-law in the book preferred) and thus into the whole “pure race” concept. The perceived decadence of Paris at the time was similar to what was thought of Berlin with its cabaret life. It fits that France should “fall” to the Nazis. As is probably obvious by now, the setting is Paris in the 1930s when the Great Depression was in full swing with unemployment, inflation, crushing debt, and the possibility of trouble brewing in Germany, later seeping into France. There have been artists in Paris since forever, but Paris has been a world center only since the early 19th century. There are 6 readers for the audio version to cover the several voices this book includes. The narrative takes the form of letters, memoirs, a biography and so on which all lead to the story of Lou Vallers from whom we have no self-narrative. 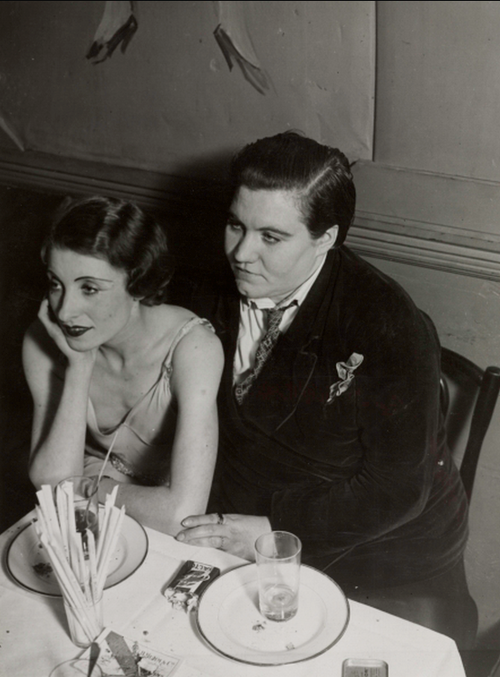 Famous Brassaï photo “Lesbian Couple at Le Monocle, 1932″ was part of the inspiration for the novel. Lou’s character is based on the real life of Violette Morris, a French lesbian athlete and race car driver who joined the Gestapo. Several other characters are based on historical figures as is the Chameleon Club. The history of France, which is vital to my understanding of the book, is accurate and compelling. Gabor Tsenyi, a Hungarian photographer (BrassaÏ? ) is writing letters home to his parents in Hungary – his assistant keeps notes. Gabor has a book published and it’s a success and he’s a hard worker. His girlfriend, Suzanne Dunois is jealous. Baroness Lily de Rossignol, an ex-actress who married into the Rossignol family (auto makers) is a wealthy woman who helps starving artists including Gabor and Miller. She and her husband Didi hire Lou to drive for their auto company. Didi is a part of the Resistance, but his brother Armand, is a rather outspoken Nazi sympathizer. Suzanne Dunois, Gabor’s girlfriend, jealous of everything Gabor is concerned with from his camera to the people. She tells the story of Hemingway and the he-man types – writing her memoirs. Yvonne, the owner of the Chameleon Club – 3rd person, (I think?) Used to sing there. Pays off the cops – mostly concerned with the safety of her business. Arlette, a pretty singer at the club, Lou falls in love with her but she’s a flirt, flirts with Chanac who is a fascist-type police chief – he’s fired after the riots. Lou – her story is told in the memoirs or a biography by Natalie – NOT a friend of Chanac as she wears many men’s clothes – she drives for the Baroness who becomes her patron for car racing. She loves speed and wants to win – is well trained. But Lou is not a terribly “nice” person, especially after she loses her license and racing job/career. 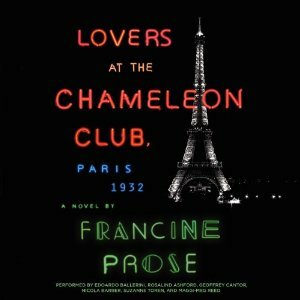 The story moves along in generally chronological order with the ins and outs of the relationships amongst a set of acquaintances who often meet at the Chameleon Club. I’ve found that with historical novels where the reader knows a certain event is coming up that it works well to use a very few clues as to the general times of the story and then chronological order because the coming of the major event creates its own suspense. We just watch the build-up knowing what the characters don’t know. Also, few people who have not looked into it have heard of Violette Morris and what her ending as Lou Vallers will be. I suppose that there is a theme of the danger of too much patriotism – to the point of Xenophobia and ultimately outright racism here – France above all – back to the beloved Napoleonic codes (about appropriate apparel). This is what led to a lot of French willing to fall in line with the “racial” policies of the Nazis. And it gets graphic enough – there’s a section in the last 1/4 or so which is truly horrible – although I’ve read worse. I’m getting to accept that historical persons will appear in fiction and that their actions, words and characters might be changed considerably for the author’s purposes. I have to read for another purpose – I have to research what I’m curious about and either acknowledge the author’s adherence to accepted history or give the author credit for imagination. I can do that most times but there are times my suspension of disbelief just snaps – like when we have Lou and Inga talking to Hitler. The book is obviously written with the sensibilities of 21st century readers in mind – the idea of whether or not homosexuality and cross-dressing or transvestitism should be banned is a non-issue these days. Giving Lou a troubled brother is fictional and imo, to garner reader sympathy for Lou.